Meet the Girl Boss Embracing Diversity and Inclusion in Fashion, Media & Print. 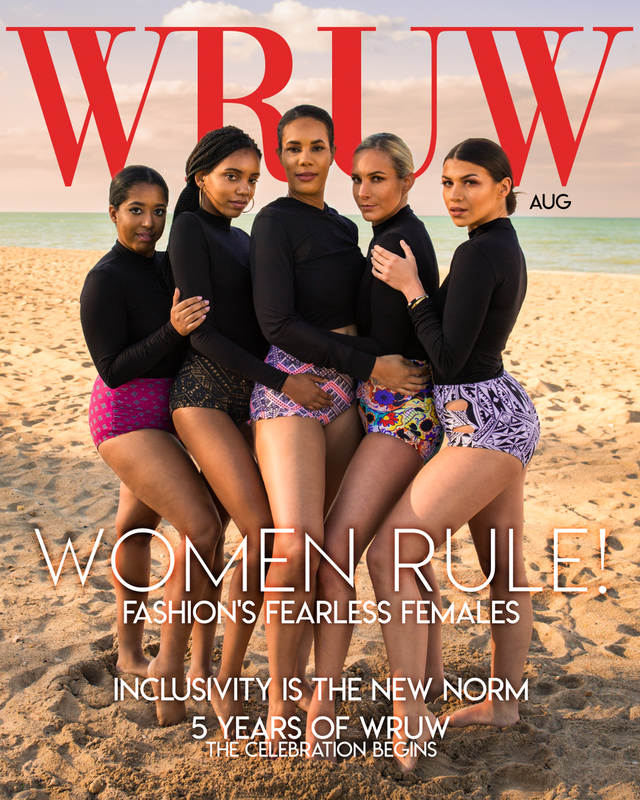 At the reveal of WhatRUWearing’s Reflect Me Like campaign I had the opportunity to catch up with the founder Farissa Knox for an exclusive interview. She explains her inspiration behind the campaign, what she wanted attendees to take away from the event plus what we can expect next. She is working to inspire people to understand that we need to be reflected the way we see ourselves and not the way that other people see us. 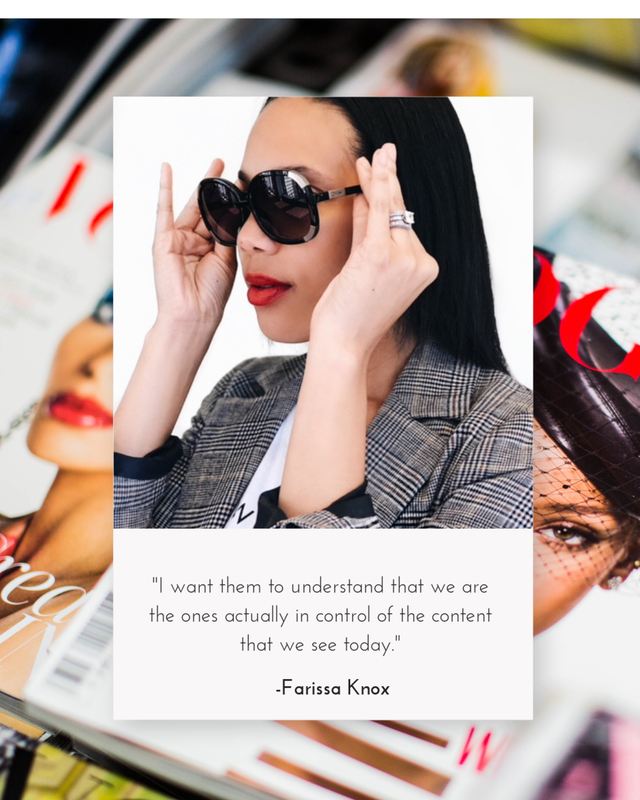 What we decided to do was come up with a creative way to make a statement about the fact that there is not enough inclusion and diversity today in the lifestyle and fashion space when it comes to media, print and digital. Our way of starting that conversation was recreating some of the most iconic and personally our favorite magazine covers in the fashion, music and lifestyle space. We use ourselves as models and with people and women and rockstars that are inspiration to us. And we then took the titles and some of the story lines in the publications and made them our own so we were not just copying. First and foremost I want people to leave inspired to be honest with you. I want them to understand that we are the ones actually in control of the content that we see today. Because if we don’t like it then we don’t have to click on it. And if we don’t click on it then people don’t get paid for advertising and they don’t get sponsored and all that. Click and engage with the type of content that really engage with who you are and support them. And that’s what we are trying to be. We’re trying to be one of the people involved in the start of this conversation. So what can we expect next from WhatRUWearing? A lot, we’re working constantly on new features. We do editorial, we have a podcast season 6 of our podcast Candid Creators will be launching in a few weeks so check itunes out for that. And we have a reality show called PR Girl that we’re filming right now and that launches towards the end of October this year. And we have plenty more ideas that I hope to be able to create. Essence always manages to bring out the crowd, even in the pouring rain. 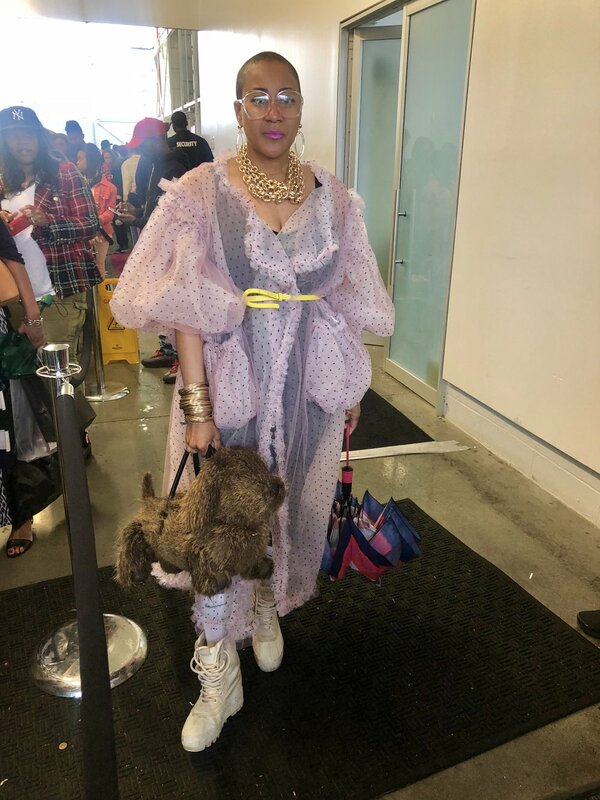 New York showed out on the rain but that didn’t stop fashion lovers from styling with their umbrellas. 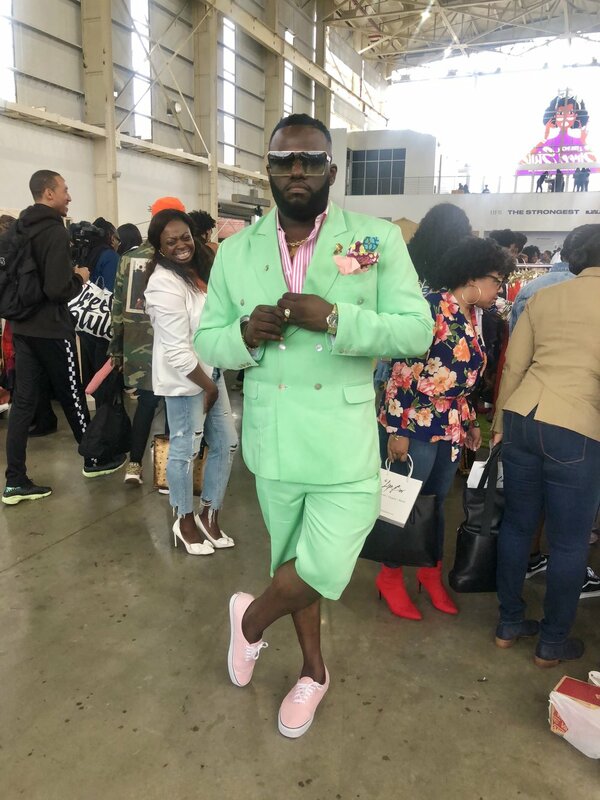 Sunday, September 9th during New York Fashion Week was Essence highly anticipated Street Style Fest and fashionistas + fashionistos were in attendance from all across the world. The event took place at the Duggal Green house where there was musical performances, giveaways, brand activations, and free food. 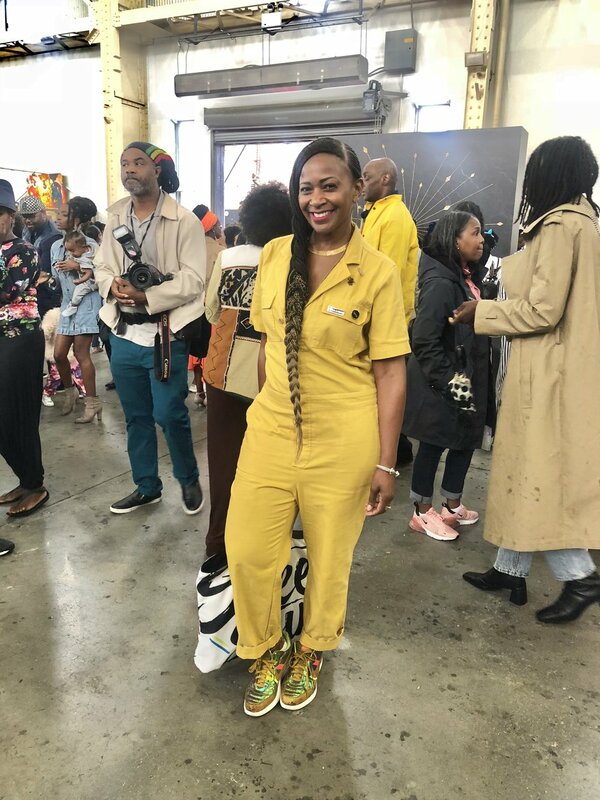 Next to the amazing festivities we rounded up our top Seven favorite looks from the Essence streets. Street style is all about embracing your DNA. This means putting together looks that reflect your personality and genetic makeup. It’s not about looking cute or doing what others around you are. It’s truly about embracing your uniqueness and creativity. Thanks Essence for giving everyone this platform to show what their style is made of. I don’t know if you noticed but the sneaker industry has been on a rise. High end brands such as Gucci to Zara are adopting the trend and offering them in array of unique styles. For US consumers they are known to us as comfort. But to the UK culture, trainers are a way to identify one with their generation. I sat with UK sneaker collector, Emil Socialize, and producer of the United Kingdom's first documentary about UK’s sneaker culture, Soleseekers. He spoke with Bomb and Bossy about the influence UK has on the US, his sneaker collection, plus what he wants us to take from the film. Q: You’re here to present your film Sole Seekers, tell me what was you inspiration behind it? A: The inspiration behind sole seekers was my love of shoes and the fact that UK wasn't represented in global sneaker culture, or trainer culture. I wanted to do something that highlighted the UK's influence and presence. Something basically for the UK. Q: Tell us about your sneaker collection. Is it a huge walk in closet? Right now you’re rocking off white. A: I've got way to many shoes in my house it's now a problem. There's so many more shoes that I want I moved about three or four times in the last few years and I've got shoes everywhere. My mother called me and she said come get your shoes, and she piled up these shoes. I got about 600 pairs at her house. Yea.. way to many shoes. Q: At what age where you when you realized I’m a sneaker head? A:You know what.. In the UK the term sneaker became new to us, we never used that. When we were like ten or eleven that's when we became fashion conscious with school. We would like certain shoes or certain things in certain colors and we wanted to get the latest ones. It was school; it was a bore. I was eleven, I wasn't going to GQ or Fader. I saw something on TV so that's where that came from. Q: What is it you want us to take from this documentary? A: From the US point of view I want you to see the UK point of view. I want you to see the differences and the similarities. I want to try to bridge the gap if I can. We are bombarded with US culture, US tv shows, US fashion. But it's the european influence that I'm trying to capture as well. I'm trying to spread the message. Soleseekers premiered at The Alpha Space in Chicago. It was apart of This.That.&The lll weekly event where they have new sponsors every Thursday. To find out what's next for Soleseekers follow them on Instagram for updates. Chicago Fashion Week is a 7 day event brought to you by FashionBar Chicago. Before diving heavy into shows they kicked off #IAmChicagoFashionWeek with an exclusive invite only networking event featuring members from the Chicago Fashion Week board, designers from across the world, bloggers,stylist and media outlets. 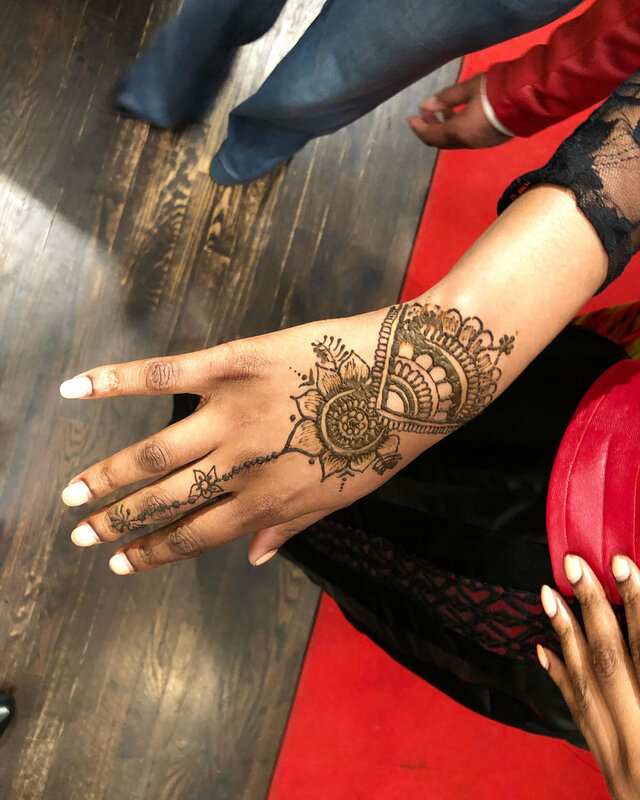 It was an evening of fun where everyone had the chance to mingle and get the chance to make new connections before kicking off an exciting week of shows. Check back later in the week for more coverage. Want up to the minute updates? Follow @Bombandbossy on Instagram and Facebook. Will you be attending Chicago Fashion Week? So this year's Grammy award took place in New York at Madison Square Garden. 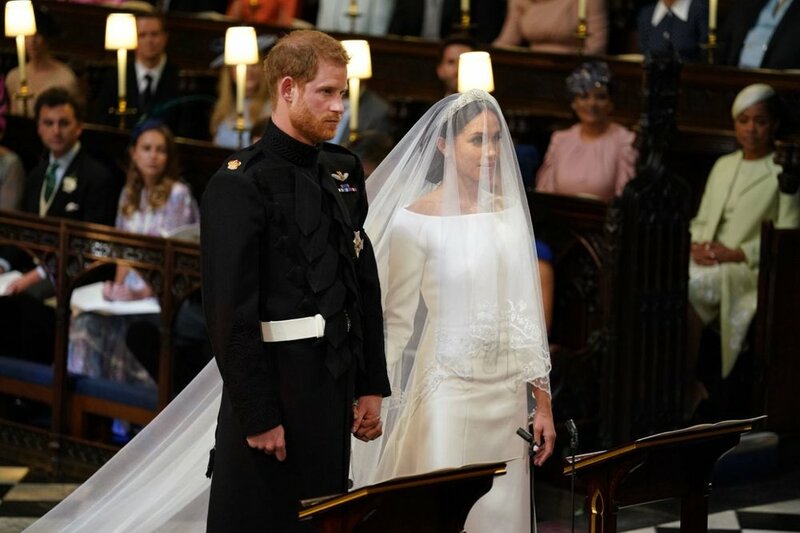 Not only was "Music's Biggest Night" trending in the Big Apple, but it was the most talked about event across social media. It's been said that Lady Gaga inspired the current fashion trends of the Grammy's and well...we want to know if you agree? Let's think back how in 2008 celebrities wore what seemed to be prom dresses, but not in 2018 hunny! Check out some of these Bomb and Bossy APPROVED red carpet styles. This year, our favorite celebrities took next level style risk with no shame in self expression. Isn't that what style is all about? Everyone seemed to pull it off so well. There was also a big fashion statement that we saw amongst Grammy attendees and that was the white rose to represent the #MeToo, Times's up movement. Stars used their glow to shine a light on female empowerment, and gender equality. However, some fans were not impressed due to lack of female nominations in each award category ( But thats's none of our business ). Although SZA did not win her Grammy for Best New Artist, she graced the red carpet like an angel and killed her on stage performance like a boss! 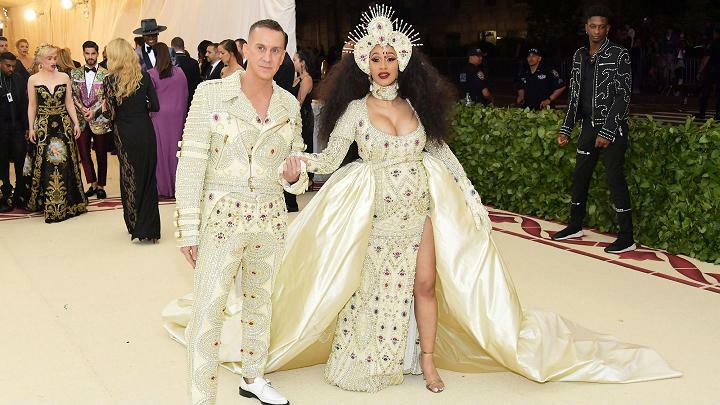 So many celebrities brought out their most fashion-forward looks but we couldn't help but notice the beautiful white gown that Cardi B stepped out in. She showed us how she can style her first Grammy awards, and we're no mad about it. Get it sis! Ms Rita Ora keeps it classy in black from head to toe with her signature red lip and a Time's Up rose. 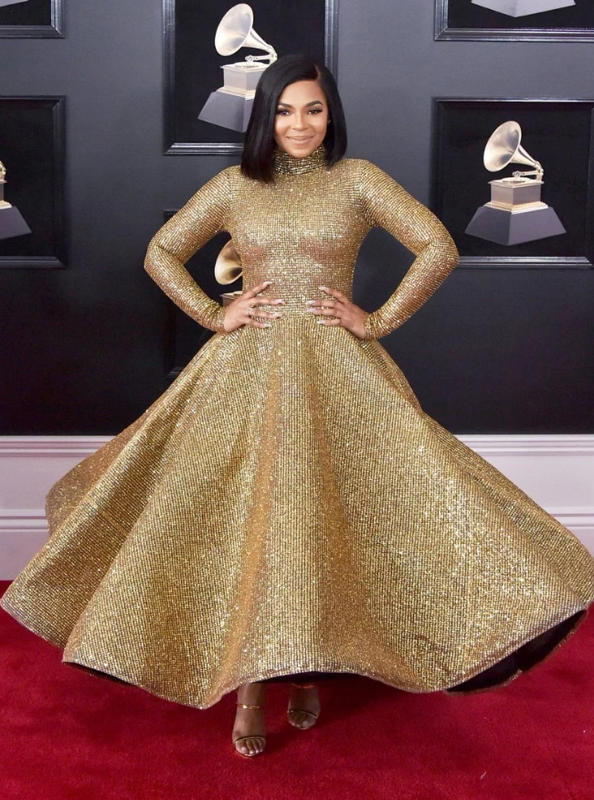 Ashanti dazzles in gold from her high neck with long sleeve gown to her gold sandals. And last but not least, Eve sparkled in a two piece Naeem Khan beaded suit. These were only a few of our favorite looks that we wanted to highlight. But you can view more red carpet style here. At the start of the year I decided that I would attend at least a few fashion shows per month on behalf of Bomb & Bossy and promote them on our blog. I kicked off the year by showing up to Wired The Design Boutique's volume one fashion show, where Safaree of Love & Hip Hop was the host, alongside Blake Martin of Blake Martin Productions . From the moment I walked into the door I knew this event was Bomb & Bossy approved. I would have captured some shots at the step and repeat but the food and drinks in the VIP section were calling my name. I also had a slight cold the night of the show so I wanted to get warm and settle in. Like any fashion show, guest came dressed in their Sunday's best, or shall I say Friday's best. But none of these looks topped the styles presented on the runway. 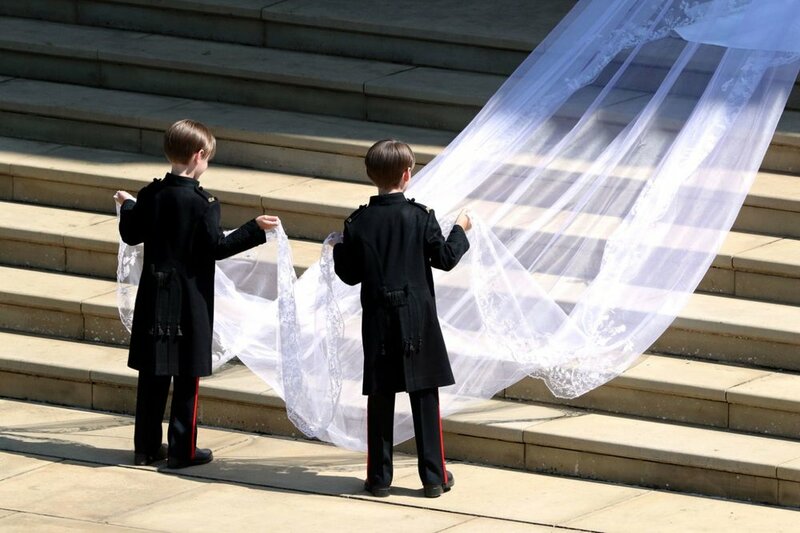 Looks were broken down into scenes, and of them all, lace was my favorite. I didn't get many pictures of the models in each piece but you can find their latest collection on their website. If you're looking for high end looks without breaking the bank then you should check our their boutique. They have been in business for a little over a year now and so far they are breaking down fashion walls. This is only the beginning and I see more success coming for their business. They are ran by a team of a amazing people! To Ronnie, thanks for allowing B&B to grace the presence and be a part of your special night. You have a great venture in your hands and i wish you nothing but the best! This message has been Bomb & Bossy approved! Do you have a business event that you think we approve of? We want to come and show our faces so contact us today! We are all about leveling up and supporting one another.